Let’s continue our visit to Myanmar’s lovely Inle Lake. As our longboats pulled into ourhotel dock, we had a very special welcoming committee. These adorable children dressed in colorful outfits greeted us with choruses of “Mingalabar!” and showers of rose petals. Turns out the children are from a nearby orphanage which Don visited during our stay at Inle Lake. He said it was an amazing place, clean and bright with excellent facilities. This was an impromptu visit arranged at our group’s request, so we know it was “real.” In fact, the kids like it there so much they don’t want to leave when they have an opportunity to be adopted. Seeing the way the locals live and eke out a living on their small farms, Don understood why. Like the Bagan Aureum Palace, the Aureum Palace Resort was a sprawling series of villas. Because we had a lake view in Bagan, we were a row back this time. The villa was spacious and unique. Look at this bathtub! After another excellent buffet lunch, we reboarded the longboats and headed off to two sites. First we visited the Na Phe Chaung Monastery, a wooden monastery built on stilts over the lake at the end of the 1850s and the largest on Inle Lake. I was most amused by the sign at the entrance. Wondering about the cat photo? At one time the monastery was famed for its trained jumping cats. While they are no longer part of the attraction, many cats roam freely on the grounds. The monastery is also known for its collection of Buddha images in Shan, Tibetan, Bagan and Inwa styles showcased on 100+-year old tall, ornate, wood-and-mosaic pedestals and cases in the Shan and Northern Thai Buddhist styles. 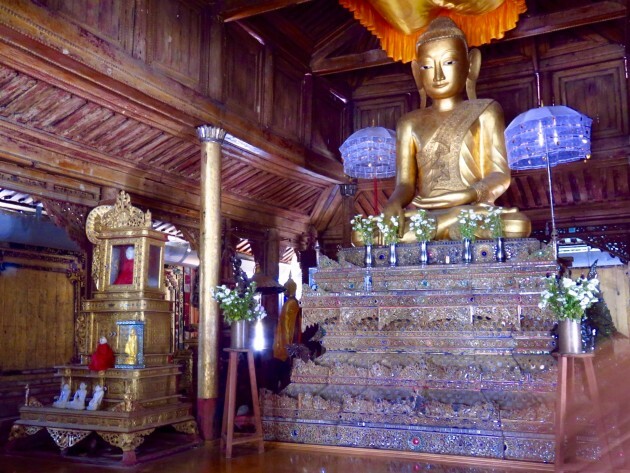 As we entered several novice monks arrived and sat down to pray and study in front of one of the larger Buddhas. They were soon joined by another monk who chanted the readings. The last photo in this group is a dormitory for visiting students. According to the information National Geo provided, most Burmese boys become temporary novice monks, a source of pride for parents. They are dressed as princes and parade on horseback, shaded by golden umbrellas (too bad we didn’t see this). They stay at a monastery for a week or more to learn about Buddhism and receive other training. Some girls become temporary novice nuns, though it’s not as common. From the monastery we took another long boat ride to the other major site on Inle Lake, the Phaung Daw Oo Pagoda. Like us, you may be tired of temples and pagodas. Our visit here was brief, though, and there is a noteworthy reason to see it. Look at these Buddhas! So many visitors have made gold leaf offerings over the years that you can’t even tell these lumpy statues are Buddhas! Then it was back to the hotel for another sumptuous buffet, and to rest up for our final full day in Myanmar. It was, Shanna! Thanks for stopping by.